Six police officers from the north east have been recognised for their extraordinery bravery during an emergency rescue. They were presented with their awards at the Scottish Police Federation Bravery Awards ceremony in the Macdonald Holyrood Hotel in Edinburgh on Thursday, November 30. The Ellon officers won the overall Scottish Police Federation Bravery Award for 2017. Sgt Andy Sawers, PC Kirsteen McArthur, PC Carolyn Wright, PC Calum McDougall, PC David Ritchie and PC John Grant rushed to a crash in December last year, where two sisters, Amy Duguid (12) and Kirsten (14), were trapped in a submerged car after it had gone off the road and into a river. Sgt Sawers, PC Ritchie, PC McDougall and PC Wright all went into the freezing water to free the trapped girls. 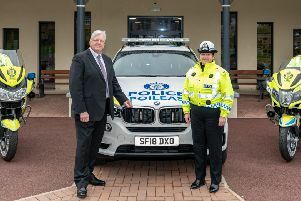 PC Wright prised the car door open with a crowbar and along with PC McDougall, freed Amy and pulled her up onto the embankment, where she was helped by, now retired, Kirsteen McArthur. Kirsten was unconscious, not breathing and was trapped in the car by her seatbelt. Once removed from the car by PC Ritchie and out of the water, PC McDougall and PC Grant administered CPR, however, Kirsten sadly died hours later in hospital. Sgt Sawers said: “The whole team really pulled together so well. “It was dark, confusing and freezing, but everyone worked hard to save those girls. Lianne and Gary Duguid, parents of Amy and Kirsten, said: “We would like to thank all of the police involved for the bravery shown. “Their efforts putting others before themselves is highly commendable and resulted in saving our daughter’s life. This was the third annual awards dinner to honour officers who have performed outstanding acts of bravery while on or off duty. The officers were invited to attend a Parliamentary Reception at Holyrood before the evening awards ceremony.